Inspired by historical Scottish weapons and given a regal twist, the Yellow Gem Thistle Sgian Dubh features a silver tone thistle emblem upon its textured hilt and multi-faceted yellow gemstone set within its distinct flat pommel. Made out of stainless steel, the blade of this traditional Scottish dirk features light serrations along its back, next to the hilt. A silver band decorated with an ornate thistle panel appears at the top of the handle, echoed by a similar band encircling the pommel gem. Made of black composite, the handle is textured with lines and grooves that lend a sense of intricacy to the daggers overall design while also reinforcing the sturdiness of the grip. A matching black composite sheath, decorated with silvery thistle designs, is included with the replica knife. 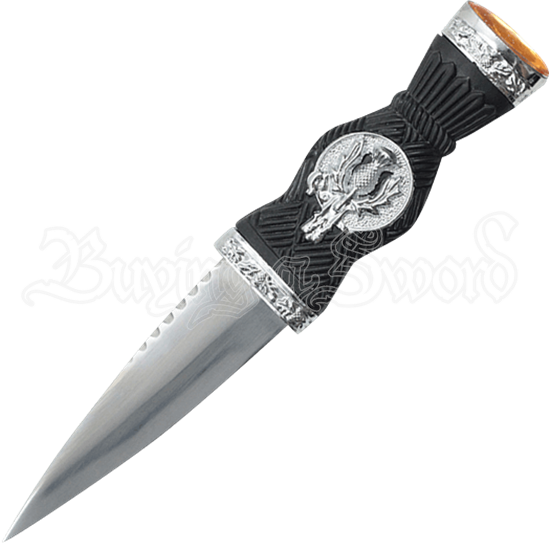 Whether incorporated into a Highlander reenactment ensemble, displayed with pride, or gifted to a loved one intrigued by Celtic culture, this stainless steel Scottish dagger is a beautiful display of Highlander history and regal design. Copyright © 2019 Buying a Sword. All rights reserved.